Don Trahan is one of the most respected teachers in the game of golf in the United States of America and around the world. Golf industry experts, Tour players, and fellow professionals consider him one of the most knowledgeable instructors in golf. They gave him his nickname, "The Swing Surgeon," because it is said that Trahan can take apart a golf swing and put it back together without leaving any scars. 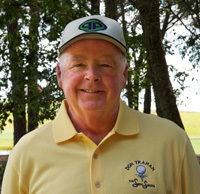 Prior to his work at the famed Harbour Town Golf Links, Don ran golf schools in Florida and was head golf professional at Pinetree Country Club in Kennesaw, Georgia. He has been a golf professional for over 35 years. Don's passion for helping golfers play better and enjoy the game more resulted in the creation of several distinctive training aids and instructional videos. These instruction and training tools have become the nucleus of his company, The Swing Surgeon Group. Currently, Trahan is fully involved in developing his website, which includes a daily blog, instructional videos, golf training aids, golf schools, golf instructor and club fitter certification programs, as well as healthy living products.